on secondment to National Crime Authority, Adelaide, S.A. Event location: Former NCA Office, 124 Waymouth St, Adelaide, S.A. Murdered in Adelaide, SA whilst on secondment to the National Crime Authority. BOWEN was killed when he opened a letter containing a bomb at the Adelaide Headquarters of the NCA. He joined the Police Force on August 30 1976. Every slain and seriously injured WA police officer would be automatically honoured with a special commendation medal to mark their selfless community sacrifice, under a new plan to be mooted at the WA Police Union conference today. The idea, which is modelled on an award offered by Victoria Police, has been raised by outgoing union deputy vice-president Jon Groves and has won support from the state opposition and families of officers killed in the line of duty. Opposition Leader Mark McGowan will unveil a proposal at the police union’s annual conference on Monday for a WA medal, similar to the Victoria Police Star and the US military decoration the Purple Heart, to acknowledge officers killed or seriously injured while on duty. Under the concept, fallen officers including Constable Damien Murphy, who was run down and killed by a drunk and drugged driver in Craigie in 2007, would be posthumously awarded the medal, along with those who sustain life-changing injuries – like Senior Constable Matt Butcher, who was left partially paralysed by a “flying headbutt” during a brawl in Joondalup in February 2008. It would apply to all work-related injuries, including psychological illnesses, regardless of whether the conditions first manifested on or off-duty. “The Victorian Government has struck a medal for police officers who are seriously injured or killed in the line of duty and it recognises the sacrifice, valour and contribution of those police officers,” Mr McGowan told Fairfax Media. “It’s only awarded rarely, but it is an appropriate recognition and certainly gives families of those who have died in the line of duty some additional recognition of their mother or father, husband or wife. “It’s also for those who are seriously injured in the line of duty – so officers who put their lives on the line and get injured as a consequence…that they are appropriately recognised for that. Mr Groves said a medal that acknowledged officers killed and maimed in the line of duty – and not only acts of bravery – was needed to highlight their community sacrifice and the risks that police officers come up against every day of their working lives. “We need a medal that recognises the police officers in this state who have paid the ultimate price – either with their lives or their health – in serving the community,” he said. WA policeman Simon Bowen was five years old when his father WA Detective Sergeant Geoff Bowen was killed by a parcel bomb at the National Crime Authority in Adelaide in 1994. Detective First Class Constable Bowen, who has served with WA Police for seven years, welcomed the idea saying a special medal would validate the ultimate sacrifice his father made. “I think it’s a great concept in not only is it a keepsake, but it’s something else in the present that will identify the sacrifice and the memory,” he said. “It’s a small token that you can just marvel at and look at it and say, for my situation, the memory of Dad is never going to be forgotten not only by me but by the blokes that he used to work with and generations to come. Tracey Ball, who was widowed when her husband Constable Peter Ball was run down by a car and killed while chasing a suspected car thief in Cannington in August 1998, welcomed the police medal proposal. The couple’s daughter, Brianna, now 17, was only 18 months old when her father died in the line of duty. “Brianna was just 18 months old so she really has no memories of her dad,” Ms Ball said. “She’s very proud of him but she never really knew him, she never got the chance. So to have something physical and tangible that links who he was as a police officer, I think would be extremely important to her. “My granddad served in World War I and we have his medals. Having those medals, we used to do the Anzac Day parade and we were so proud and patriotic. To have chance to have that for someone in the police force, I think would be awesome. A WA Police spokesman said the force already offered several Police Commissioner’s awards for bravery and conduct including the Cross for Bravery, commendations and a group citation for conduct. In addition, there is also the WA Police Medal for diligent and ethical service, service medals, the Commissioner’s Medal for Excellence, a Certificate of Outstanding Performance and a WA Police Cadet Medal. The spokesman said the Western Australia Police Cross for Bravery could be awarded to officers killed or seriously injured after a specific act of bravery and members killed in the line of duty were also recognised on the WA Police Memorial Honour Roll and the National Memorial Honour Roll. He said the “existing awards and medals are quite comprehensive” but declined to comment about the proposal for a medal for officers killed or seriously injured in the line of duty. “I am unaware of any proposals for new medals and the department does not make a habit of commenting on speculation or possible proposals,” he said. that is all well and good, but what do those officers who put their body on the line for their state, and then get arrested, interrogated, humiliated, insulted and shamed get? I wonder if the medal will be awarded to officers with psychological injuries who have died from these injuries like PTSD, depression and anxiety? 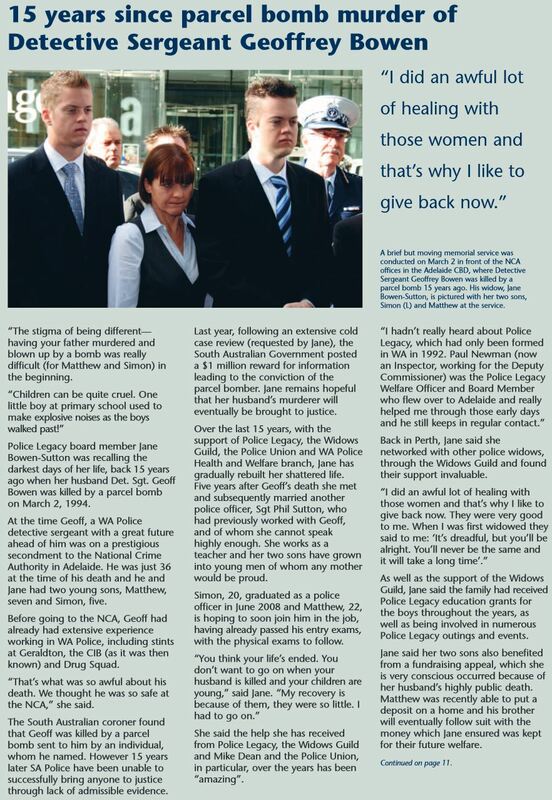 My husband died on duty from depression after 15+ years service….surely he, and other officers like him deserve to be recognized too? This issues has been raised for quite literally decades that I have been aware of, and yet the Dep’t has chosen to ignore the injured in the hope they will leave. It is only if you suddenly become high-profile media interest then they cannot ignore you. The embarrassing fact is as things stand, all the officers who came to Matt Butcher’s aid can be recognised, but there is literally nothing that can be given in acknowledgement to Matt himself as there was no “clever act” they can use for a special commendation. And not even Toxic Tony could spin a believable one for the actions of an unconscious man. This has been raised at the highest levels in emails that were ignored and not replied to. If they finally come to the table on this one, great! Allow retrospectivity, even better. The men and women who put their life on the line so you can be safe deserve nothing less!